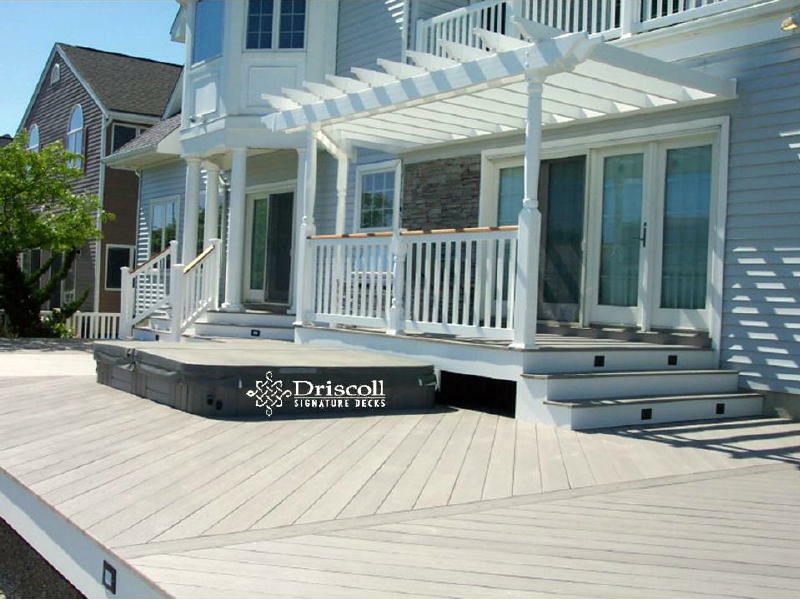 This Driscoll Solution Story starts with these LBI Decks on one of those beautiful inland waterside properties unique to the Jersey Shore. It is 4-level custom with a back entranceway onto a step-down sunbathing level, then up to the main level with built-in spa and dinning area, then up to the paverstone kitchen and main entrance under the pergola, with lovo accent lighting on every level, plus white vinyl railings with Spanish Cedar top rails and finally a paverstone walkway all along the bulkhead and around the side of the house to the front driveway. 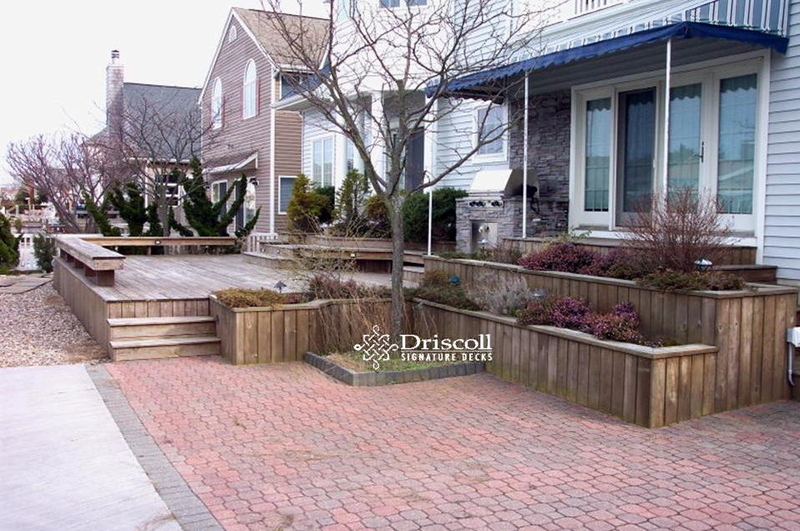 The image above is before Driscoll Decks started and shows the old small deck and interlocking brick patio. Surprisingly, this beautiful waterside home was not ten years old, but sometimes that beauty can also be the nemesis. Note the old blue and white awning, which will soon be replaced by a new Driscoll pergola. The main entrance to the deck is a 6-foot slider under the old awning; it will soon be the highest of the 4-levels in the new Driscoll custom deck design. But, soon it will be a new Driscoll Signature Deck. 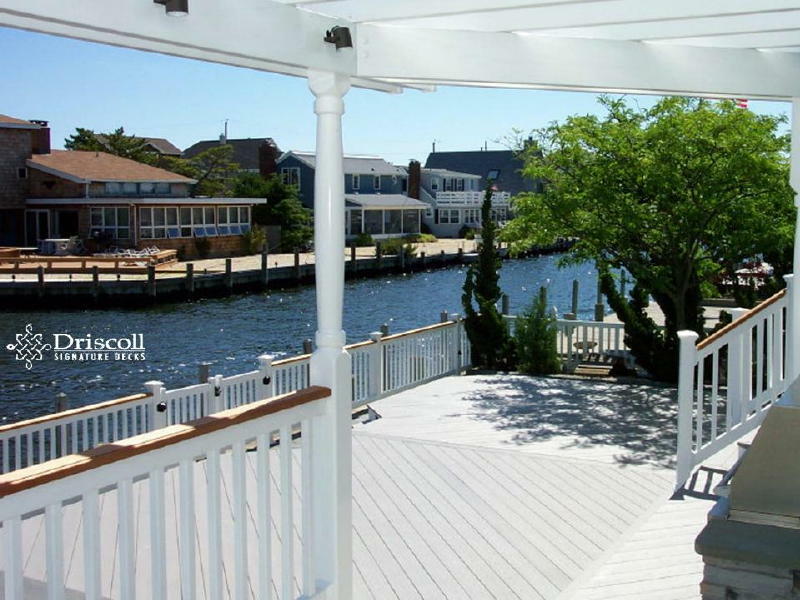 We always start with Driscoll Signature robust framing, especially in this beautiful but hostile waterfront environment. You can see the 2-main levels beginning to take shape, with the built-in spa all ready in place. Then see the barbeque level which is the same level as the 3rd step down from the back entrance door. 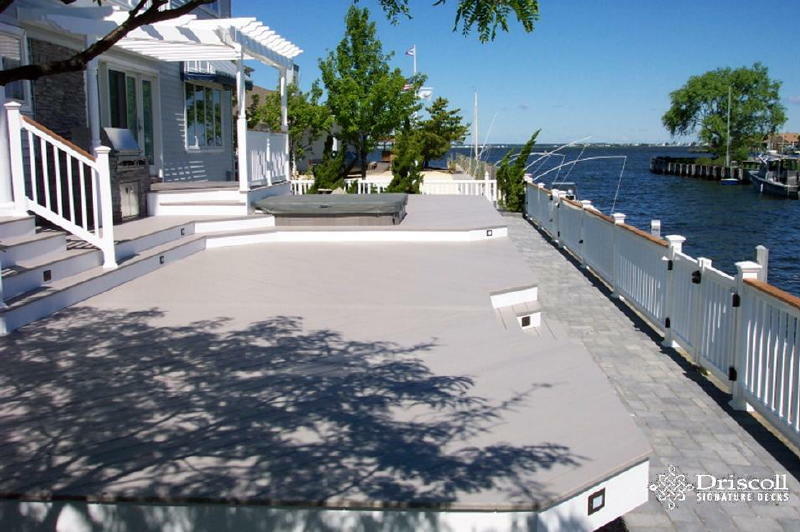 Note the gravel in front of the deck on the waterside and the top of the bulkhead without any railings (scroll down to finished deck below!). This 4-level cellular-vinyl deck is almost done. Please note the center parting board changing the direction of the diagonal decking board patterns. Please note the built-in spa and behind the spa and under the stair platform we left a space (which will get a small trap door) for maintenance work on the spa. This is the main entranceway to the deck with an overhead white vinyl pergola. That sure looks better than that old blue and white awning as shown in the above – before – image. Also note the lovo accent lighting on the stair risers and the outside fascia at the end of the parting board. This view is from the upper level porch or the platform entrance area under the pergola. Please note the lovo down-lighting in the pergola and the Spanish cedar handrails on this top platform deck and the rear entrance deck PLUS the cedar top rails all along the bulkheaded waterfront..
All the railing, including along the waterfront are white vinyl with Spanish Cedar top rails. We then laid out a paverstone walkways along the waterfront (which can be seen the best in the top finished image) We built paverstone walkways all the way around to the side of the house to the driveway and to the front entrance of the house. 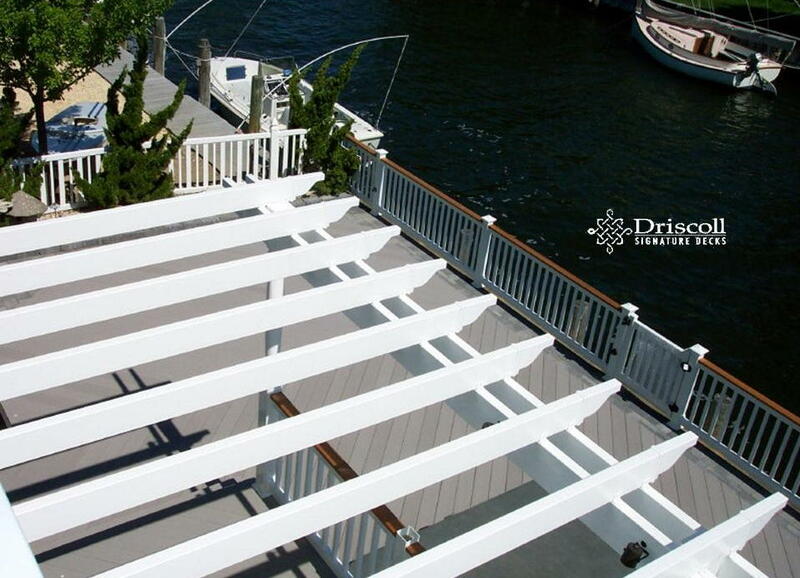 This image was taken from the upper fiberglass deck which we also repaired. You can see the gate in the railings along the bulkhead for access to a waterski dock which will be install for easy access. Our work is done here and it’s time to ‘sail away’ to our next port of call. We could build the next on for you…? 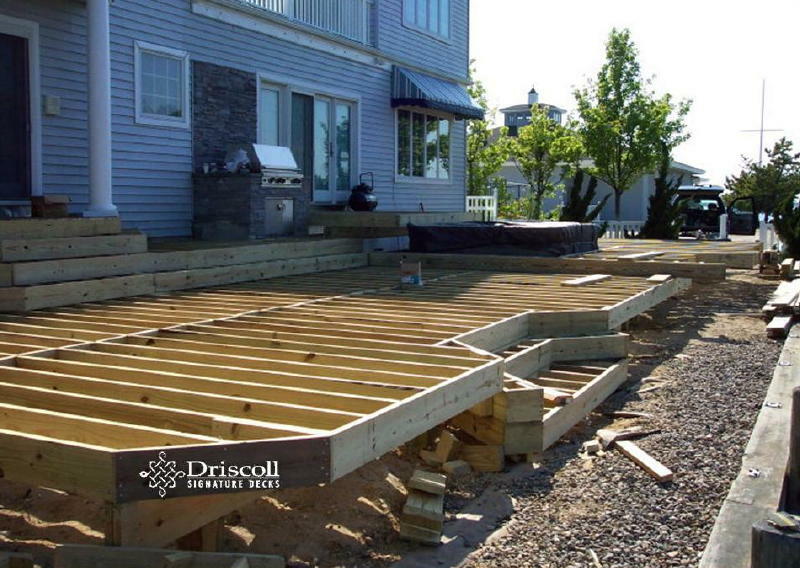 Now this is what we call a true Driscoll Signature Deck!